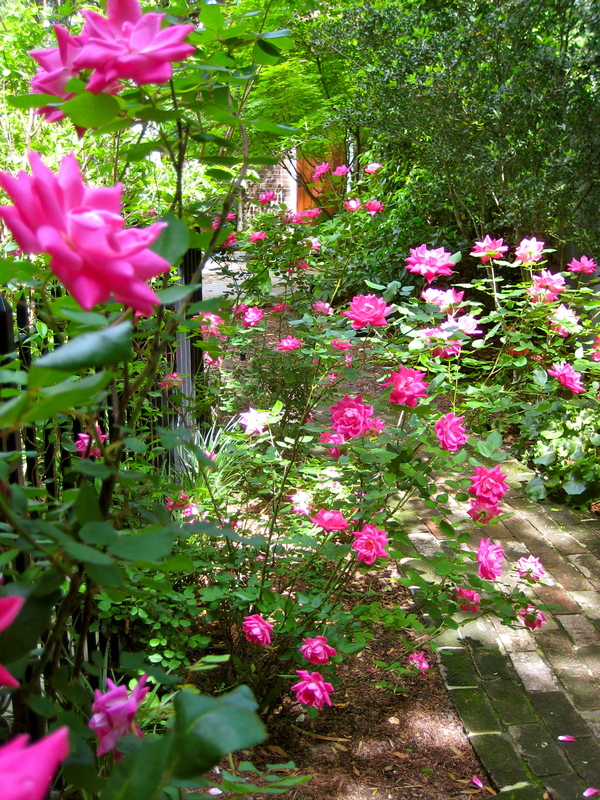 The roses are ridiculous – how they bower my garden walk with more petals and romance than any day, even in April, can make use of. Further down the brick path, the lemon trees exhale a fragrance as extravagant as the mock orange just next to it – either one alone would take me to my knees. Were it not for the jasmine stealing the whole show, up the length of the stair railing — its old, gnarled vines letting go a thunderous clap of perfume. On Friday, after a long, slow sniff through the garden, I push off into the streets of morning – the play of muscles on pavement, the practice of still mind/still-moving calves. Toward the end of my run, I see the opened iron gate to Saint Phillip’s cemetery, and I slip into the shade of oak trees, walk among azaleas and tombstones. As my blood slows, my heart fills with the presence of those buried there whom I have known, and the presence of those, not yet buried, whom I have loved. I invite them in. It has been a practice of mine for many years, this meditation on the grave. Not just on Good Friday. Medieval monks, on any ordinary day, dined with skulls on their refectory tables, reminding all of their quick turn at this cafeteria of life, searing this moment, this tasty ale, with new attention. Like them, I find reflections on our common end not morbid, but galvanizing. They sear my feet to this garden path, nostrils flaring. On mornings when I am brave, I take this meditation a step further. I ask myself to enter the unimaginable loss of my beloved, just in case life should one day ask me to lay down my most intense joy. I want to know that even then, after shattering, there could be something solid left of me, and to know what it is. On this day, already shaken with real losses all around me, I sink down into this bottomlessness. I breathe in the roses; they will be gone soon, thorns will muscle up. The jasmine, in summer, is sticky and mean. Beauty is easily lost. And love, happiness, can be snatched from our back pocket in a silly minute. A child, vanished. A blood test, insinuating. A note left screaming on the table. In just a random month, these have exploded lives in my orbit. We are walking through mine fields. Right there in that beautiful old cemetery on the breeze of an April morning, I go ahead and step on all the mines. I detonate a life without the people and things that just a minute ago I thought I could not live without. Strip off all my illusions of permanency. Of entitlement. Of solidity. I enter something liquid, like the movement of atoms in space, like the transfiguration of matter into light. I enter the fantastic, floating, fluctuating present, utterly emptied; no more than a bee on the petal of morning. When I emerge back out onto the sunny pavement, I gather up my shorn selves, I turn toward home. This is only practice. But, through it, I’ve found that what’s left, when all that I cling to is stripped away, isn’t exactly solid. No, but there is something there; for that I’m grateful beyond words. More like a feathery thing at the center of if all; glinting in the easter light, aloft on the wind. ~ by Susan on 04/24/2011. What a beautiful, Easter post. When all is lost, still something remains. Easter proclaimed! I noticed this year that John says, “And there was a garden at the place where Jesus was crucified. . .” The garden is at the place of tragic loss and just there is the place the nystery of the empty tomb is experienced also. Your expression of that ” thing with feathers” found in the garden is courageous and sublime. Thank you.